Learn more about the Lorex Nocturnal 4K Ultra HD Audio Dome Security Camera with pricing, features, and frequently asked questions. The Lorex Nocturnal 4K Ultra HD Audio Dome Security Camera is a security camera from Lorex that can be installed indoors or outdoors and has a built-in microphone for audio recording. 113° FOV for monitoring wide, open areas. Pros: Can capture audio as well as video. Made for harsh climates. Cons: Must be connected to an ethernet cable. No remote adjustment. Bottomline: A durable security camera that is well-suited to outdoor use in climates with extreme weather patterns. What are some alternatives to the Lorex Nocturnal 4K Ultra HD Audio Dome Security Camera? Where can I buy the Lorex Nocturnal 4K Ultra HD Audio Dome Security Camera? The Lorex Nocturnal 4K Ultra HD Audio Dome Security Camera is available on Amazon or on the Lorex official website. Does the Lorex Nocturnal 4K Ultra HD Audio Dome Security Camera work at night? Yes, the camera is equipped with night vision that can see up to 200 feet in the dark. Can the Lorex Nocturnal 4K Ultra HD Audio Dome Security Camera be used in any weather? 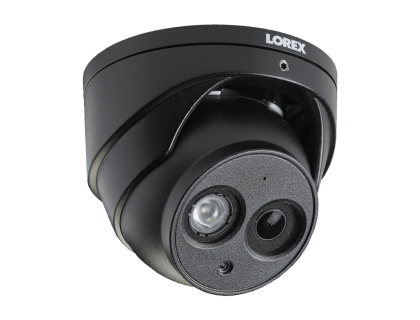 The Lorex Nocturnal 4K Ultra HD Audio Dome Security Camera was designed for use in any weather with its rugged aluminum exterior.